LET THE CHILDREN SMILE Children are all pure and lovely no matter where they are from. They love to play and smile. 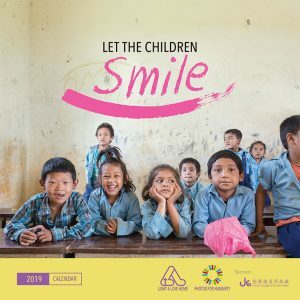 We’ve captured the children's smiles in this year’s calendar. May their smiling faces bring you warmth and enchantment. Smile at home. Smile at work. Smile to the people around you. 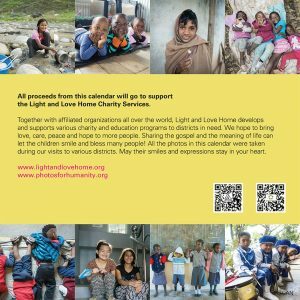 2019 Light and Love Calendar: $5 each. Buy 4 get 1 free All proceeds go to support Light and Love Home Charity Services Together with affiliated organizations all over the world, Light and love Home gathers resources, visits the needy and cares for the orphans. We develop and support various charity and education programs to establish long-term and effective services. EMPOWERING THE NEEDY. CHANGING LIVES. By the love of Christ, we attend to people’s deepest needs around the world. Read about how our beneficiaries felt about receiving help during their time of need. See how their dignity was restored and a bright future was opened up for them. We do more than just provide for basic necessities. Instead, we equip people to be able to care for themselves and others.